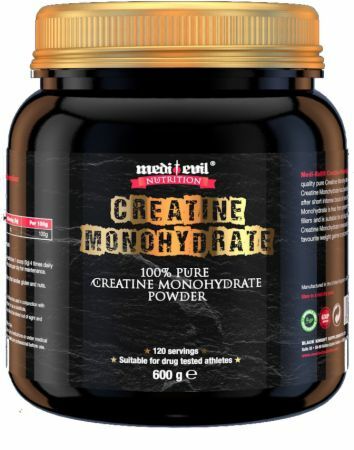 Medi Evil Creatine Monohydrate at Bodybuilding.com - Best Prices on Creatine Monohydrate! For a limited time, buy 1 Creatine Monohydrate, 600 Grams & get 1 FREE! 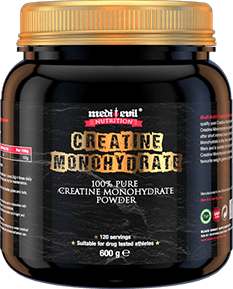 Medi-Evil Nutrition Creatine monohydrate powder contains the highest quality pure Creatine monohydrate. In clinical studies Creatine monohydrate has been used by athletes to rapidly aid recovery, increase strength endurance, and support lean muscle gains. Creatine Monohydrate has been shown to improve recovery after short bouts of intense exercise. Creatine monohydrate powder is free from preservatives, packing agents and fillers and is suitable for all drug-tested athletes. Medi-Evil Nutrition Creatine monohydrate mixes easily with water, fruit juice or your favourite weight gainer or protein shake. Medi-Evil Nutrition Creatine Monohydrate is free from preservatives, packing agents and fillers and is suitable for all drug-tested athletes. Who can use Creatine Monohydrate? Creatine Monohydrate can be used by men or women and of any level. Creatine monohydrate will help speed up your recovery as well as increase athletic performance during explosive exercise. Creatine is easy to use and can be incorporated into your daily supplement regime without fuss. No Creatine Monohydrate Reviews Found. Directions For Creatine Monohydrate: For best results take 1 scoop (5g) 4 times daily for 5 days (Loading phase). Then 1 scoop per day for maintenance. Warnings: Store in a cool dry place. This product is a food supplement and should be used in conjuction with food as a part of a healthy balanced diet, not as a substitute. This product is intended for adults and should be stored out of sight and reach of children. Do not exceed the recommended daily intake. If you are pregnant, breastfeeding, taking any medications, or under medical supervision, please consult a doctor or healthcare professional before use. Suitable for drug tested athletes. Always read label before use.